This spectacular journey through Central Europe takes us from the Vistula to the Danube, traversing a landscape steeped in tradition, history and fine wines. Travelling from the architectural splendour of Krakow we cross the alpine landscapes of the Tatras Mountains, down to the Hungarian steppes and into the famous winelands of the Tokaj-Hegyalja region. Crossing the Carpathians we enjoy some exhilarating and gentle cycling along the scenic Hornad Valley, leaving cliff-top castles, rural villages and historic towns in our wake.Beginning our journey in Krakow we head towards the mountain resort of Tatranska Lomnica, nestling amongst the jagged peaks of the High Tatras National park. 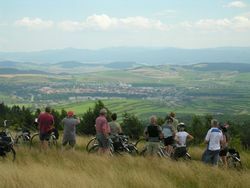 From here we cycle through dense pine forests and alpine meadows en route to the historic towns of Kezmarok and Levoca. We visit the imposing ruins of Spis Castle, a UNESCO site whose high vantage point affords us some spectacular views across the surrounding landscape. Traversing the quiet country lanes that follow the course of the Hornad River we then head through the Carpathians, the scenery becoming more tranquil and rolling as we head into the warmer climes around Kosice, Slovakia's second city and a vibrant mix of old and new Europe. Continuing south from here we join the course of the Bodrog River as it meanders through a terrain of vineyards and villages towards the Hungarian border. Next stop is Satoraljaujhely, occupying the northern uplands close to the Zemplen Hills and Hungary's most northern town. A disused railway then takes us through the famous wine producing landscapes of the Tokaj-Hegyalja region, en route to the picturesque town of Tokaj. The end of our journey sees us travelling to the heart of Hungary's vibrant capital. Join tour Krakow. We meet in the evening in an old town restaurant. Today we cross the border into Slovakia, driving to the town of Tatranska Lomnica, nestling amongst the ragged peaks of the High Tatras Range. 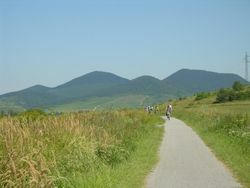 Taking lunch in Tatranska Lomnica we then begin cycling, enjoying an exhilarating downhill ride to the historic town of Kezmarok, once one of the most important settlements on medieval Slovakia's eastern boundaries. Colonised by Germans during the 13th century the town stood second only to nearby Levoca in importance and its old town still retains a distinctive medieval feel, dominated by the imposing presence of its 15th century castle. The town also boasts a superb wooden church, considered by many to be one of the finest in the entire country, as well as some outstanding examples of Gothic architecture, including the Basilica of the Holy Cross, built in the 15th century on the site of the original church built by the town's German settlers. Cycling to the charming old village of Hradisko this morning we have the opportunity to crest the top of nearby Brezova Hill for some spectacular views out across the Tatras. 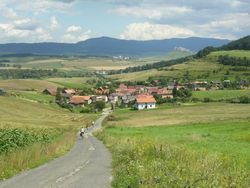 Continuing along the ridgeline we then cycle through a quite breathtaking vista, before enjoying a downhill coast to the historic walled city of Levoca. Abounding with beautiful Renaissance architecture and impressive fortifications, the town presents us with one of the most captivating locations in the entire Spis region. Colonised by German settlers in the 12th century much of the town's present character was forged during the 16th century, after a fire necessitated a rebuilding of the heart of the town, endowing this hidden gem with a quite spectacular collection of Renaissance and Gothic buildings. Levoca's centrepiece is the 15th century Church of St James, the second largest Gothic church in the country and boasting the world's largest wooden altar, along with some particularly fine frescoes. The town's main square is littered with an array of impressive town houses and its Town Hall is amongst the most stunning of this remarkable collection of historic jewels. Leaving Levoca behind this morning we cycle uphill, following tracks that take us past a patchwork of fields, up to Sibenik Hill for some wonderful views across Levoca and the Tatras beyond. From here we follow a series of minor roads, through a collection of small villages until we reach the town of Spiska Kapitula, once the religious capital of the region and for some 600 years almost entirely inhabited by clergy. 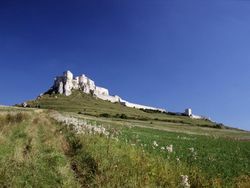 We visit the ruins of the nearby Spissky Hrad, once one of the largest castles in Central Europe. Occupying the ridge high above the town, the castle was originally built by Hungarian Kings at the turn of the 13th century, eventually meeting its end in 1780, since which it has remained a ghostly testament to the conflicts and internecine politics that once plagued this region. From the top of the Gothic Tower there is a spectacular all round view of the surrounding landscape. From here we cycle downhill to the village of Zehra, to view its 12th century church, before continuing to the old mining town of Krompachy in the Hornad River Valley. Lying at the junction of three major mountain ranges - the Levocsky Hills, the Branisko Massif and the Volovsky Hills, the town is blessed with some superb scenery, surrounded on every side by rising peaks and plunging valleys. We will be staying at the nearby ski resort of Pleisy, affording us the ideal opportunity to take in some of the wonderful views and ambience of this mountain setting. Today we journey along the Hornad River Valley, following a network of cycle paths and minor roads, traversing a landscape that takes us through the Carpathians to the town of Kosice. As we cycle through Margecany, the river changes into a substantial reservoir, with high steep banks that are carpeted in wild forest. We aim to stop for lunch at a restaurant somewhere close to the waters edge, before resuming our journey along a forest road that skirts the reservoir. As we near the end of the day's journey the mountain landscape changes to a more gentle terrain of rolling hills as we enter a warmer climate zone lying amongst the southern boundaries of Eastern Slovakia. Kosice is the country's second largest city, where the old and the new come together in an eclectic fusion of sights and sounds. 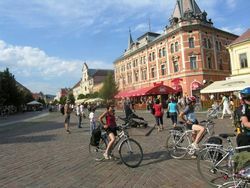 The ity is littered with museums and churches and its labyrinth of charming narrow streets make it perfect to explore on two wheels. Originally a Slav settlement, the city has had a somewhat chequered history, gaining importance under the early Hungarian empire, before attacks from the Turks saw its important trade routes interrupted and its commercial importance decline. Its allegiances and influences have continually moved between Czech and Hungarian factions over the years and even today its has a vibrant Hungarian ethnic community. Passing between the rolling hills of Eastern Slovakia we head first for Slanec Castle this morning, a 13th century Gothic ruin that occupies the hills above the Bodrog River Valley. Passing through a vista of vineyards and villages we pass through Velka Trna and Mala Trna, en route to Satoraljaujhely just across the Hungarian border in the northern uplands close to the Zemplen Hills. Strategically located on the trading routes to Russia, Poland and Transylvania, the town thrived during the Middle Ages, being granted town privileges in 1261 by King Stephen V. The most northern town in Hungary, nestling amongst a landscape of forests and vineyards, it also played a key role in the fight for independence from the Austrians and today is part of the famous Hegyalja wine-growing region. Cycling along the Bodrog and Tisa Valleys today we follow an abandoned railway line that takes us via the historically important town of Sarospatak. Once a centre for Calvinist power and thought, the town has also played a pivotal role over the years in Hungary's fight for independence from the Habsburg yolk. We take time to visit the riverside castle of Rakoczi, an imposing edifice that spans some 500 years of the town's turbulent history. The castle's most illustrious owners were the Transylvanian Rakoczis, who expanded much of the Renaissance Palace and held the fortress until the early years of the 18th century, when their unsuccessful fight against the Austrian crown resulted in Ferenc Rakoczi being driven into exile and the castle passing into the hands of Austrian nobility. After our visit we continue south, following the flow of the Bodrog River towards the town of Tokaj, lying to the west of the confluence of the Bodrog and the Tisza. This is one of the most celebrated wine producing areas in the country and Tokaj makes up part of the expansive Tokaj-Hegyalja region that runs through the southern and eastern fringes of the Zemplen Hills. At the end of your tour, you can choose between two options: Either train journey to Budapest (several trains, tickets for ca 15 EUR) or transfer by minibus back to Krakow (no extra costs). We can book extra nights in Budapest or Krakow. Route description and set of good maps. Not included in the price: Travel to Krakow (and back from Budapest), train ticket Tokaj - Budapest entry fees, private payments such as other meals, drinks and tips. You can download a full list of USD-prices and GBP-prices.